For a while now, the talk has been about the amateur game not having enough events for youngsters to play in. With not many tournaments for those talented up and coming prospects, that’s all about to change. Introducing the new SnookerFans branded events! 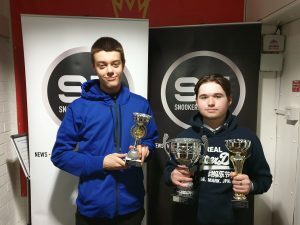 Last weekend, the team at SnookerFans.co.uk launched their first in a long line designed to revive the amateur scene and spark a new wave of talent in the UK. The first SnookerFans event started aptly being named Stars of the Future as ten of the best young talents in UK snooker pit their wits against each other on Saturday at one of snooker’s up and coming clubs in the new age – Dunstable Snooker Club, run by the humble host Suny Singh. The event was split into two groups initially with round robins for these ten talents on show and the two winners of the groups qualified for the semi-finals and final. Allen supported the event and praised the work of SnookerFans and Dunstable for putting it on. Events like these give youngsters valuable match experience in friendly but competitive settings allowing them to hone their skills and thrive on what will be a tough scene when they get older and compete in mature events as adults. Who knows, maybe one day the next Ronnie O’Sullivan or Judd Trump may emerge from the shadows? The winner of the event was Harlow’s Alex Clenshaw, who also made an incredible ton – 111 as the high break. The event was live-streamed on the SnookerFans Facebook page – so that fans across the globe could see emerging talent shining from UK shores.